Today, Margje and Maarten went to Storholmen for the final nest check, to read rings and to place temperature loggers in the nest cups to measure the environment in which the flea larvae develop or survive. It was beautiful weather, high tide. We left the boat on the calm side of the island, knowing that the water may fall still a meter, but also knowing that it would be possible to get the Zodiac into the water. We get everything out of the boat, get the boat high up on the beach and bring our gear to the lee-side of the island. There we radio Woijtek to pick us up. The trip back went fine though it was windy. Back home the wind changes again from direction and the gail is now blowing the other way. The next day I see the weather on the infobord of AWIPEV. A picture is shown below. 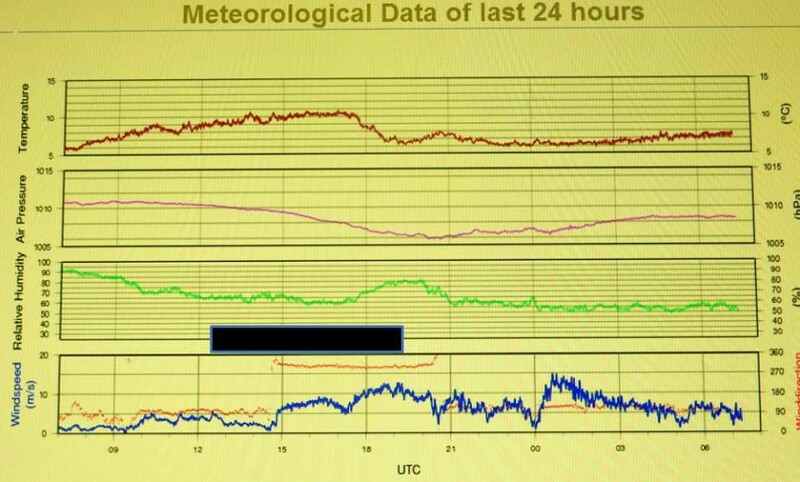 The lower panel is the wind speed in blue and the wind direction in red. The black bar is the period, we were on Storholmen. You can see the sudden change in wind direction when the wind picks up. And nothing was mentioned beforehand on the weather prediction. We were never in danger. Maybe it was lucky, that we could not start the boat as the home trip would certainly have been a wild trip. We made one mistake though. During the whole day, we had our AWIPEV radio off, while Janwillem was keeping radio watch. When we did not return in time and the weather changed, he got worried. He did the right thing and informed the AWIPEV station about the situation. Luckily he heard just in time that we had asked Woijtek to come with a Norwegian radio (we had taken both handhelds). But I should have informed him much earlier. Now we have been given a sat phone as extra communication. Many thanks for all the help.